I was finalizing my Subscribe & Save order this morning and I checked to see if my current trash back subscription was the cheapest available. I was very surprised to find this fantastic deal! So I switch my subscription over to this one! 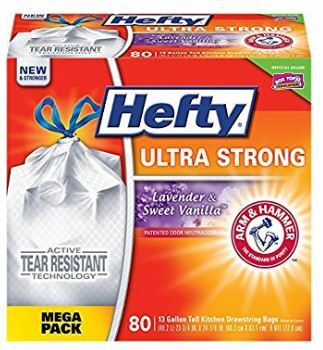 Hefty Ultra Strong Trash Bags (Lavender Sweet Vanilla, Tall Kitchen Drawstring, 13 Gallon, 80 Count) are $12.08, which compared to other 80ct trash bags on Amazon, is a good price! But what makes it even better is the 15% off coupon you can clip also! Making them $10.27. With the 15% discount for having 5 or more items in this month’s order, means you’ll save even more – pay just $8.99! Save even more with Subscribe & Save when you have 5 or more items in your monthly order! Check out this Tide Pods and Lysol Wipes Subscribe and Save deals! And shipping is FREE with Subscribe & Save!